Dental bridges are prosthetic devices made to replace missing teeth. They consist of artificial teeth placed between dental crowns to bridge the space created by missing teeth. Bridges are great for restoring your smile and appearance, as well as the ability to properly speak and chew. There are three different types of the dental bridges and our dentists during the consultation will determine which type is the best solution that will meet your needs. Bridges are usually made of porcelain and metal, and can be supported by both natural teeth and dental implants. It takes two visits to complete the treatment. During the first appointment, our dentist will prepare your teeth that will support the bridge by filing down the enamel and reshaping them. 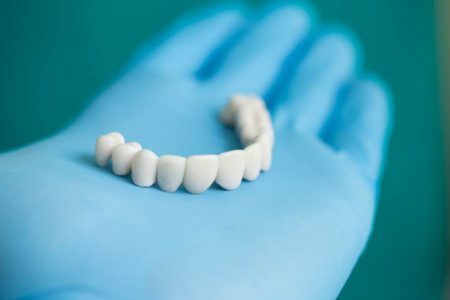 In order to have your dental bridge and crowns created, the dentist will make the impression of your teeth and send it to the dental laboratory. You will also receive the temporary bridge to wear until your permanent one is ready to prevent any complications with your prepared teeth. During the second visit you will have your bridge placed and cemented. It might be necessary to wear your new bridge for couple of weeks to ensure it fits you properly before cementing it permanently. It is very important to maintain proper oral hygiene because the durability of your dental bridge greatly depends on it. With good oral hygiene and dental check-ups your new bridge can last up to 15 years.